At the end of May VisionArc director Landon Brown along with principal, Toshiko Mori traveled to Helsinki to sit down with a group of students from the Creative Sustainability program at Aalto University to discuss the notion of Community Micro-infrastructures and systems in their city. Over the course of the last year VisionArc has trained much of our focus on understanding some of the systems that affect the stability and comfort of life in our cities. Our work in Japan during the aftermath of the 2011 earthquake and tsunami followed by our participation in the BMW Guggenheim Lab and similar collaborations in New York and other cities have allowed us the opportunity to research some of the many strategies through which crises of varying degrees are responded to at the level of community involvement, co-opted infrastructures and bottom-up strategies. In the weeks leading up to our visit to Helsinki we sent teams of students out into their city to explore how notions of, “soft-systems”, community infrastructure, and urban resilience play a part today- and in the future of- the characteristically-and often assumed- “crisis free” city of Helsinki. Here are some quick summaries of what the students observed. 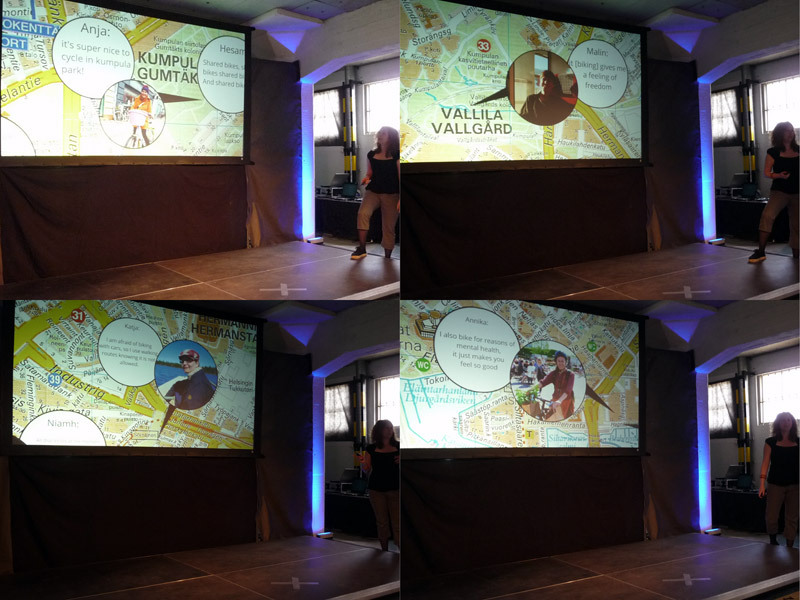 Our urban mobility team reported on the ways that a mode of transportation like cycling in Helsinki represents both a “hard” system- the network of travel paths, repair stations and parking points- and a “soft” system- the city’s community of cyclists and bike commuters. 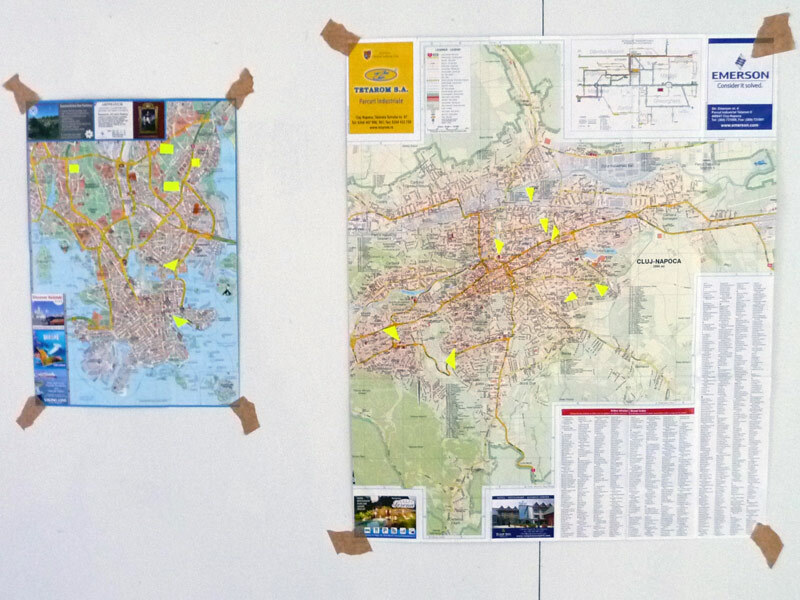 Through spatial mapping and on-the-ground urban mobility was framed as a “context that has two dimensions, both social and physical” as Aslihan Oguz , MA in the Creative Sustainability program said, “one supports or opens up the potential for the other”. 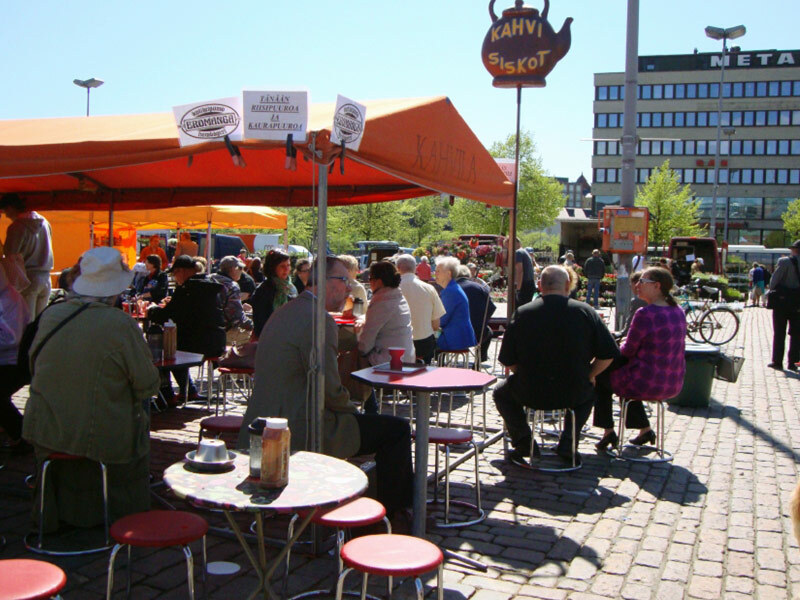 Food and food availability in Helsinki was identified as a multi-scale challenge revealed through the relationship between Helsinki’s open markets, connected to local growers and regional food varieties and the country’s small number of retail chains who dominate the majority of groceries sold on the Finnish market. While Finland is known as a country with an abundant supply of fresh, local and organic food options, the team, led by Bianca Byggmästar, speculated on the apparent absence of adequate and affordable food options: how, she asked, might we be able to reconsider the meaning of the term “food crisis” in the context of overly centralized food systems and the shifting relationship of food as both a social good and a commodity. 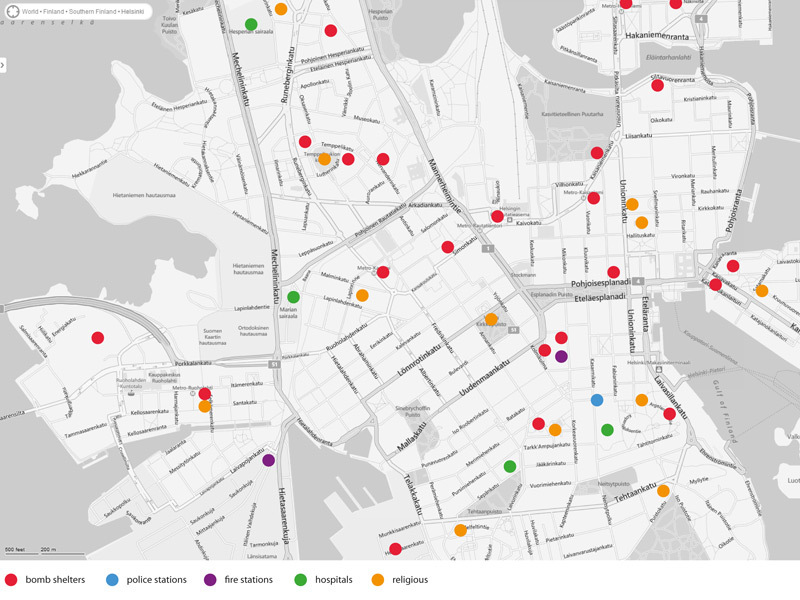 Communication, as a research topic, was framed as a spatial question in Helsinki. The team set out to ask what are the urban conditions that facilitate and prefigure meaningful social exchange between individuals, groups, and stakeholders in different communities? By identifying a range of typologies: gardens and parks; liminal circulation spaces; local businesses and shared interest areas, the team sought to position communication as a product of shared geography as much as shared language. 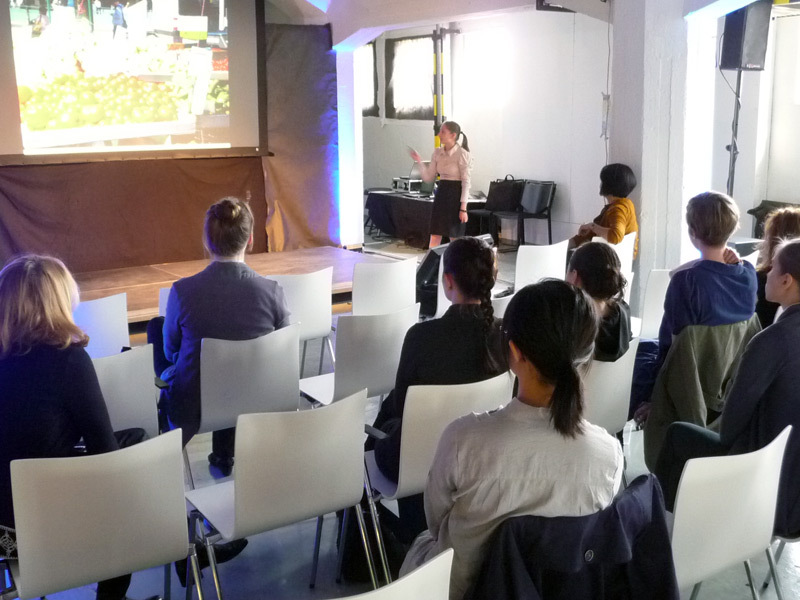 With new and emergent models in Helsinki such as equipment and skills share programs beginning to reprogram and occupy parts of the cities physical and social fabric, they speculated on the potential for new forms of resource distribution as well as collaboration functioning as a powerful form of urban resilience to address shared challenges in the future. 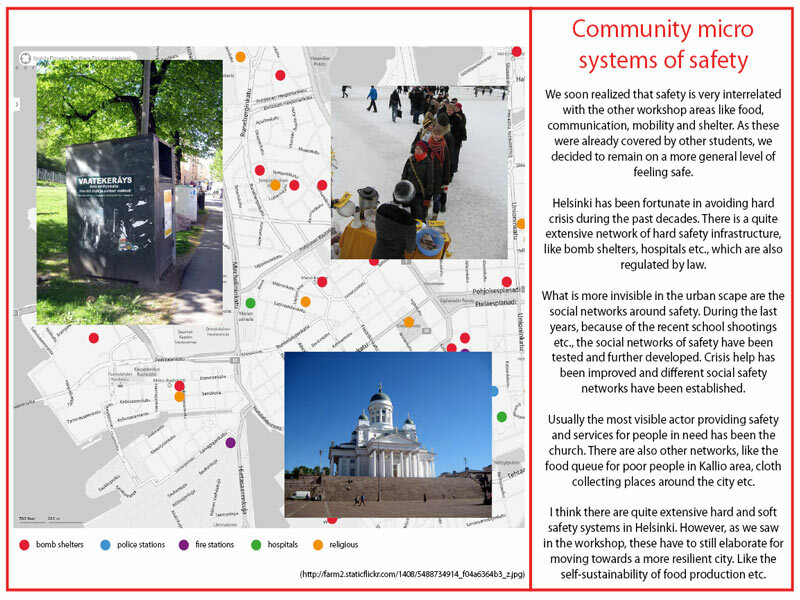 Our team tasked with looking at the concept of “safety” in Helsinki noted (rightly) that safety must be understood as a relational condition mediated by a range of factors from gender, race and age to more abstract factors like cultural and spiritual values. Nevertheless, their groundwork allowed them to identify a range of safety systems- from conventional “hard” safety infrastructures such as evacuation shelters, police and fire stations to more diffuse- yet vital- systems such as public assembly zones, urban architectural and spatial strategies, events and visual language. Their two-pronged investigation led the team to project beyond a city perpetually defined by stability and security while generating broader thinking about hidden vulnerabilities ranging from climate events to stresses caused by future migration patterns or energy shortfalls. Our exercise with the Aalto students was designed as a micro-studio and used to inform their individual research. In the coming months VisionArc will be continuing to develop similar research and workshop initiatives with some of our partners in New York City and abroad. Keep an eye out for future news and happenings.